We will practice and free our voice with the “Yoga Of The Voice”, presented by worldly renown teacher and Grammy Nominee Silvia Nakkach director of “The Vox Mundi School Of The Voice” and faculty at the California Institute of Integral Studies. "Sound as vibration has the ability to permeate all things. Sound originates in space. We live in space, breath air, receive energy from the sun and the earth at every moment, and yet, the awareness of the essential relationship with these primal elements only happens during heightened states of consciousness, when we become sensitive to the gross and subtle dimensions of these essentials. Sound travels through us, activating our bodies and our imagination, and modulating our mood in the process. We connect and process sound as information. Every think we do, think, sense, and feel, carries a vibrational frequency that creates and can change our circumstance at every moment." In addition, practitioner’s take home an original repertory of invocatory words, incantations, Peruvian icaros, mantras, and ancient seed sounds that deliver explicit spiritual information for inner transformation, and that will enrich sound healing and yoga sessions, or any therapeutic practice. The primordial and transcendent sound is considered the seed from which all of creation evolved. This is the Nada Brahma. Nada, or vibration, is the first audible sound, the primordial roaring, the resounding flow that heralds the beginning of the evolutionary process from which energy and matter radiate. Brahma, the creator God, is the creative power that animates one’s divine consciousness with the power to move the heart. Named by Utne Reader magazine as one of 40 cutting-edge artists that will shake the art world in the new millennium, Silvia Nakkach, M.A.,MMT is an award-winning composer, performer, former psychotherapist, and an internationally celebrated pioneer in the field of sound, consciousness transformation, and music shamanism. 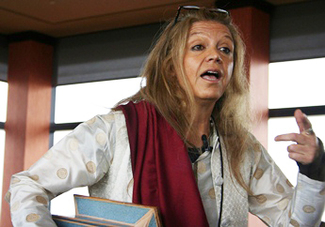 She is the founding director of Vox Mundi School of the Voice, a worldwide project that had devoted more than 25 years to preserving sacred and indigenous musical traditions, combining education, performance and spiritual service, with centers in USA, Brazil, Argentina, India, and Japan. Silvia is also in the faculty of the California Institute of Integral Studies in San Francisco, where she has created and leads the world’s premier Certificate in Sound, Voice and Music Healing established in a high academic institution. 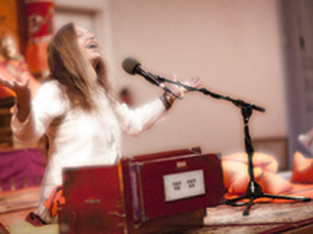 An internationally accredited specialist in cross-cultural music healing training, she has pioneered the integration of sacred sound with contemporary practices of music improvisation, and she has contributed an extensive body of vocal techniques that have become landmarks in the field of sound healing and music therapy, widely used in Palliative Care, Hospices, and Healthcare Centers worldwide. Nakkach significant body of work has been integrated in an innovative curriculum of sound and vocal principles, theories, and applications called The Yoga of the Voice, available through the Vox Mundi Project programs, archives, and publications. www.voxmundiproject.com Also Silvia’s book link Nada Yoga, Sound & the Subtle in her own words. This playful interactive experience consists of call & response chanting, playful laughter-therapy exercises, deep relaxation component sonically supported with celestial music and sound, and a healing, meditation upon the inner nadam...sound current . 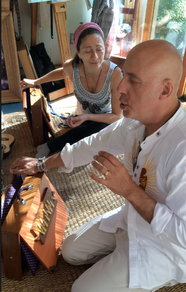 Arjhiroula "Arji" Cakouros (Oceananda) is a sound healer, musician, Reiki master and Dreamwork teacher with a private practice based in Niskayuna, NY. Her personal commitment to supporting others in achieving radiant health is rooted in her ancestral Hellenic Asclepian and Pythagorean healing traditions. She has been blissfully assisting/collaborating with Sw. Laraaji NadaBrahmananda over the last seven years offering Healing Sound events, Celestial Music performances, and Laughter Immersion experiences throughout many venues worldwide. 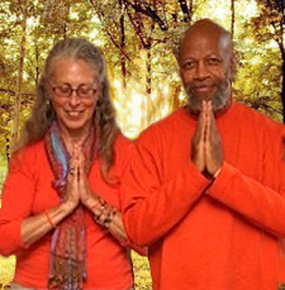 Sw. Laraaji Nadananda, initiated into sunyas in 1985 with a special ceremony By Shri Brahmananda Saraswati in the USA. He is a devotee of Nada Yoga, union with the Everpresent source through the liberating power of Nadam, cosmic sound current. He is extensively experienced in matters of Hilarity and light heartedness. Has been a stand up night club comedian and writer, film actor, Jazz Musician, composer and now performs and records exquisite soundtracks of original new music for wellness, inspiration, relaxation, meditative atmosphere and celebration featuring the unique sound of Electric open tuned zither/harps, African thumb pianos (Kalimba), free style vocal, keyboards and Portable percussion. He has developed his own style of Laughter workshops which emphasizes the therapeutic use of your laughter for interior stimulation and self love. His love for dance and creative movement aligned with yogic vision is shared along with a mastery of impromptu musical expression. Lea & Philippe Garnier will explain the fundamental principals of sound healing as it is currently being used today in private alternative and medical practices for healing the body mind and spirit. We will learn about the natural affinity and resonance we hold within our crystal core consciousness (DNA) and how sound can be integrated into our personal practice, our work with friends and family, and our professional yoga practice to enhance therapeutic outcomes and emotional releases. Students will have the opportunity to play and experience the sacred sound tools, and Philippe will be sharing his sound healing protocol. Demonstrations will highlight how to mix different sound healing instruments, and the task of each instrument to consciously aid us in our transformation and healing. Lea will demonstrate how to incorporate the sound instruments in a yoga class setting, incorporating yin, hatha, nidra, and restorative yoga sequencing, and will give various protocols for in classroom and personal use. Sacred sound instruments include sitting and standing gongs, charango, rattles, flutes, brass and crystal bowls, shruti box and voice for chanting mantras, shruti songs, icaros, bones & feathers. 1. The integration of sound healing in a semi-private and/or private yoga class setting for yoga teachers, and how to choose the most appropriate sound tool for seated postures, standing poses, forward bends and heart opening poses. The student/teacher will learn where to place tools for maximum benefit. Students will be encouraged to use their intuition vis-a-vis the science of sound healing. This protocol can also be adapted for individual practice. 2. The integration of sound healing with both a yoga teacher and a sound healer in a large classroom setting using Hatha & Restorative yoga as a format using the same support system as above, but adapted for larger class size. Lea Garnier is a certified yoga teacher trained in the Desikachar linage, and specializes in teaching yin and restorative yoga workshops which integrates the therapeutics of healing sound with a variety of different sound tools. She has worked as a craniosacral therapist for over 15 years with a private practice in New York and at Sage Center for the Healing Arts in Woodstock, NY, a center she co-founded in 2007, and co-directs with her husband Philippe Garnier. 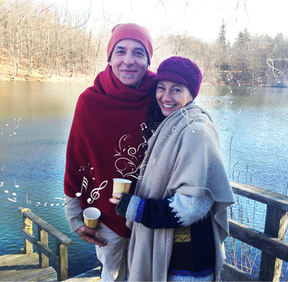 Lea also co-founded and co-organizes, the Annual Sound Healing Symposium taking place at Menla Mountain retreat in upstate New York, which caters to an international audience of practitioners working in the healing arts. She is also a painter whose works have been displayed, sold and published in Europe and New York State, as well as a recording artist of mantras, Icaros and sounds for healing. Originally from Paris, Philippe Pascal Garnier discovered the healing properties of sound 15 years in search of healing himself back to “harmony”. His sound healing knowledge comes in part from working with the Amazonian curanderos, training in techniques that facilitate healing of the soul and body, and residing a year long with an Apache tribe, walking the red road, living the "native" way in New Mexico. Philippe's work is also very much influenced by John Beaulieu, N.D., PhD., Grand Gong Master Don Conreaux, both advanced and original researcher into many aspects of sound healing. Many other teachers have also contributed to Philippe's broad-based education in the healing application of sound. Philippe has been teaching nationally and internationally and has been offering group sound healing sessions in numerous yoga studios in Manhattan, around the north East in Ashrams, and abroad in Paris and in the South Of France. Philippe shares this expertise as a Sonotherapist/sound healer, with the public through the organization he co-founded and directs: Sage Center For The Healing Arts & The Academy Of Sound Energy, in Woodstock, NY. Philippe also studied yoga meditation in the Himalayas with his teacher Shivamji and is a practitioner of the Vipassana as taught by S.N. Goenka in the tradition of Sayagyi. He took refuge with His Holiness the 17th Gyalwang Karmapa and received the Blue Medicine Buddha Empowerments from His Holiness the 14th Dalai Lama in 2006. The Sanskrit proverb ‘the universe hangs on sound,’ suggests that the right sound, at the right time, in the right place, is what nurtures the synchronization of our body and mind, and perhaps sanity in the world. Steve Gorn’s music arises from the wellspring of Indian classical music, a living tradition, rooted in nada yoga (the yoga of sound.) Attuned to the time of day, quality of light and awareness of environment, this music offers a unique sonic landscape for healing arts, yoga and meditation. Steve Gorn has performed Indian Classical Music and new American Music on the bansuri bamboo flute in concerts and festivals throughout the world. His gurus are the late bansuri master, Sri Gour Goswami, of Kolkata, and Pandit Raghunath Seth of Mumbai, who he has often accompanies in concert. He has also studied with the late Ustad Z. M. Dagar. During the past decade Steve has often performed in India, appearing at Bharat Bhavan in Bhopal, Triveni Hall in New Delhi, The Sangeet Research Academy in Kolkata, NCPA, and The Nehru Center in Mumbai, and numerous other venues. His performance with Pandit Ravi Shankar’s disciple, Barun Kumar Pal, at Kolkata’s Rama Krishna Mission, was televised throughout India. In the New York area he often performs with Pandit Samir Chatterjee as well as the Darbari Ensemble with sitarist, Allyn Miner and the sarangi master, Ramesh Misra. 11:00 pm - check in. Call & response chanting, laughter-Yoga, meditation upon the inner madam. ​Philippe & Lea: The Ways Of The Gong, The International Peace Greeting. Closing session: Gong Bath with Lea + Philippe Garnier.